Home » Email vendor Selection Articles » Cloud Based Email Relay, On-Premise MTA, or Hybrid What Is Best? As a high volume email marketer that sends more than a couple of millions of emails per month, you can be concerned about your campaigns or email copy. But there is something just as important – the infrastructure you select to set up your email marketing operations. Think of your email options like a gym. Your on-premise Mail Transfer Agent (such as PowerMTA and EmailSuccess) is a fancy home gym, and cloud based email infrastructure (an SMTP email relay ) is a gym membership. The home gym (on-premise Mail Transfer Agent) may be more expensive and takes longer to set up, but it is always available for your exclusive use. Home gyms always have the equipment you need, and you can add more whenever you want. The gym membership (cloud based email infrastructure) is cheaper and easier to set-up. And there can be gym classes you’ll want to join. But they may not have your favorite equipment, and it is not as close and exclusive as a home gym. 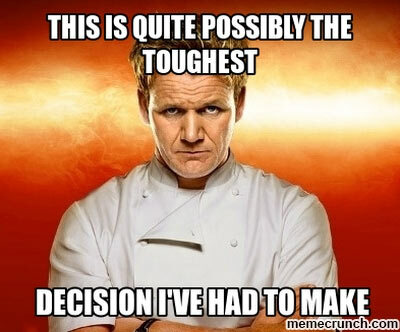 There are pros and cons to each, don’t take the decision lightly. Choosing one or the other can affect your campaigns’ effectiveness, deliverability, and ultimately – ROI. Fortunately, we’re here to help. 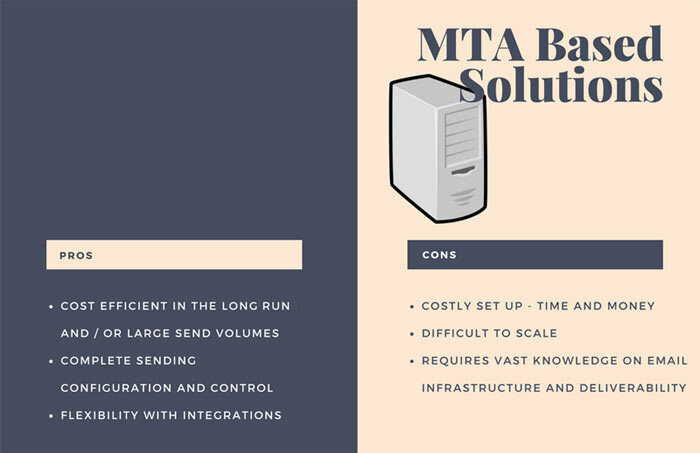 Here are the top pros and cons for on-premise MTAs and cloud based email infrastructure to help you decide which email set up is right for your company. So you have the money and room for a big expensive on-premise MTA – good for you! What do you get with that? The first and most important thing you get is complete control of your entire email marketing operations. On-premise MTAs are, as the names states, on a company’s premises. They provide email marketers with easier backend integrations and more control of their sending configuration from start to finish. This lets companies manage every aspect of their email sending configurations, tuning them to their specific needs. They can configure each ISP or mailbox send rate and the way hard and soft bounces are marked. On-premise also means that your infrastructure is not shared with others. Your operations won’t be impacted by mistakes or use from others. Thus possibly improving dependability in the long run. Today companies want more than email infrastructure that is configured to their unique needs. They want an accurate and holistic view of their entire operations. A key way to get that is by integrating all the various tools and software a company uses. Having an on-premise MTA is a way to make sure you can integrate with local data. Your email marketing infrastructure can be connected to any other on-premise data sources you need. Some companies have heavy restrictions on Personal Identifiable Information, and for good reasons. With some on-premise MTAs, companies can integrate any CRM, BI tools or even financial software, they otherwise couldn’t. It is good to create a more complete overview of their email marketing efforts and get more accurate insight into the impact of email marketing campaigns in relation to the entire operation. Companies can also use direct database integration, XML integration or server to server integration. With an MTA like that, you are less limited by APIs or web hook restrictions. Setting up an on-premise MTA can be costly in the short run. 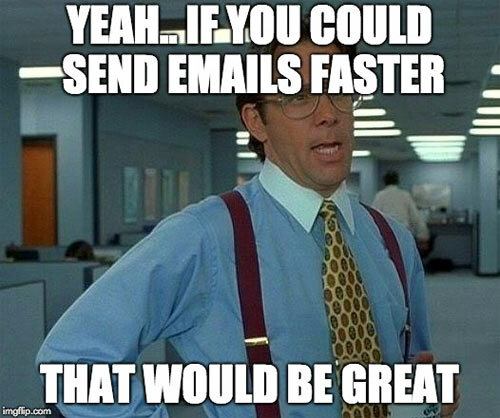 With that being said, companies that send more than a couple of millions of emails per month, or do not want to suffer from deploy delay will instantly see the benefits of one. You will never feel limited by prices per email or feel secondary in send speed. Like a home gym, an on-premise MTA isn’t for everyone. If you don’t have the space for the equipment you need, the time to set up the facilities or the budget, you’re better off choosing a different option. The initial MTA setup can be costly. According to the email infrastructure specialists at Postmastery, pricing starts at $4,000 for licenses per year. When Adding the MTA installation, configuration and IP warmup process, you’re looking at approximately $6,000 to get started. Additionally, you have to factor in the running costs such as the servers and email delivery monitoring. Setting up an on-premise MTA also takes time. Postmastery tells us that the average time to get everything up and running is about 3 months. Companies that need to set up their email marketing infrastructure quickly will not be able to do so with an on-premise MTA solution. Once the equipment is purchased, setup and configured, it isn’t always smooth sailing. Often the learning curve for email marketers is longer with an on-premise MTA. On-premise MTAs also bring with them the added responsibility of purchasing and managing IPs. Now you are the one responsible for the security of the entire email database. If the on-premise MTA solution has a size limitation, you may encounter another problem. MTAs often cannot be scaled easily. While scaling is definitely doable with MTAs, it comes with related costs and time investment. The revolution cloud technology has brought to the world have not skipped the email marketing world. Companies no longer need a home gym to stay fit. Today there are flexible gym memberships that can be upgraded, downgraded or stopped whenever they want. A cloud based email infrastructure is no different. Companies that want to start rolling out campaigns quickly will like cloud based infrastructures. Since the ESP or SMTP relay provider has done all the heavy lifting, all that’s left is integration & migration work, and you can start sending out campaigns. This is good for companies that need a quick solution, or that do not have the IT resources to engage in lengthy email configurations. 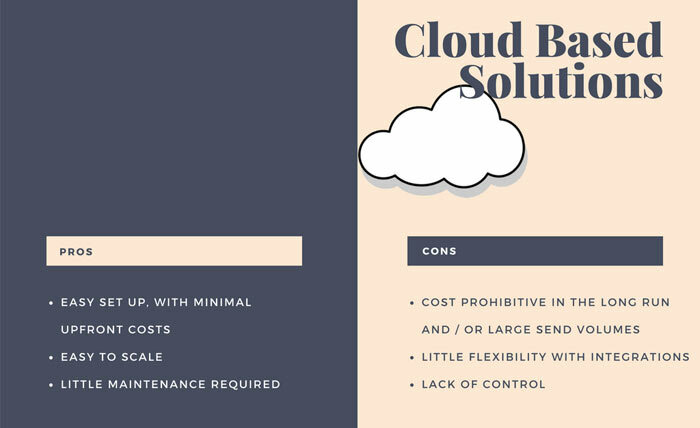 Since there is no hardware cost or upfront installation costs, setting up a cloud based infrastructure is significantly cheaper than an on-premise MTA. By leaving the setup and configuration to an expert company whose sole purpose is to improve their cloud based email solution, there’s no need to worry. Companies don’t need to review each aspect of it to ensuring that it is optimized for email marketing. Another pro for cloud based infrastructure is the security headache it relieves the companies from. If with an on-premise MTA you are responsible for security and IP management. Cloud based solutions take care of that for you. The best thing about cloud based infrastructure is the fact that it can easily grow with your company needs. The cloud based solution can be scaled up (or down) as needed without need to integrate or configure further. If the gym is packed, you don’t have time and there’s a queue for the equipment you want, the best gym membership in the world won’t help you. That’s just how it is with cloud based infrastructure. The flexibility, scalability and lower set up price comes at a cost. Many times, cloud based infrastructures charge per 1,000 emails sent, making it not so cost-efficient in the long run for large volume senders, or senders that plan on scaling to large volumes sooner rather than later. 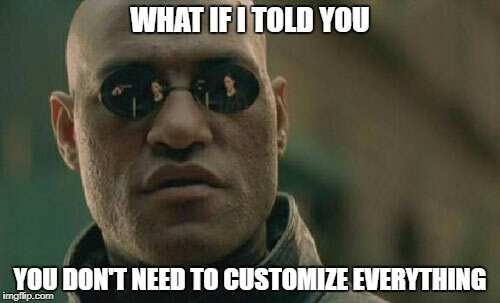 Integrations can also be a limiting factor. You are basically limited to the solutions the cloud company offers. If you selected a CRM that does not integrate with your cloud based email infrastructure, you might face a problem. The biggest problems companies face with a cloud based solution is the lack of control and security over their database. If the cloud solutions security is compromised, your entire database may be at risk at no fault of your own. If you want to workout in private but take a spin class every now and then, all you need to do is set up both and voila – you get the best of both worlds! In the email marketing world, enjoying an on-premise MTA and a cloud based email infrastructure is possible, and even easier than you think. It’s called a hybrid MTA and cloud email solution, and it might be what you’re looking for. With a hybrid solution, if your cloud solution is down for maintenance, your MTA can pick up the slack and vice versa. You can ensure that your email marketing operations are never impacted by outages, maintenance or downtime. Having a hybrid solution also ensures that deliverability issues can be managed better. If you are suffering from temporary deliverability issues with a particular ISP and your on-premise MTA, you can reroute campaigns through another SMTP relay. A hybrid solution gives you the time to correct the issue without big impact on your operations. The best thing about a hybrid solutions is that it can be configured to your exact needs. As a result, companies can optimize their costs according to their needs. Companies can separate lists based on user behavior and use cloud infrastructure for some subscribers and on-premise MTA for more active ones. By doing so they reduce the CPM cost while maximizing control of campaigns. Fortunately for companies today, they do not need to select one or the other. They can enjoy the flexibility and capabilities of both on-premise MTAs and cloud based solutions. Doing so provides companies with the ability to maximize their control, reduce costs, improve operations and ensure they always have a backup email solution (just in case).